Teara launched her aviation career as a commercial pilot. Becoming a pilot was transformational, truly giving this young Indigenous woman wings – she loves to see others fall in love with flight. 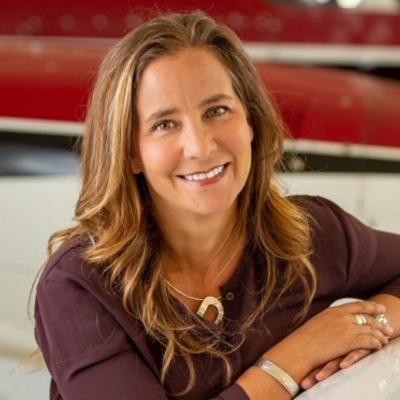 A natural entrepreneur she built an aerial survey operation from the ground up and established the Aviation Leadership Foundation. She serves as Board Director for the British Columbia Aviation Council (BCAC). As the visionary of the Raven Institute, she sees connected hearts, minds, and hands in a united and thriving nation. Rooted in Indigenous ways of knowing and being, Raven is contributing to the development of humans, organizational systems, and community. Teara holds a Master of Arts in Leadership degree from Royal Roads University, and she is a Certified Executive Coach. Teara completed the Aboriginal Focusing-Oriented Therapy (AFOT) and Complex Trauma certificate at JIBC. The journey of learning now takes her back to Royal Roads as Associate Faculty and to Fielding University where she is studying in the Human Development Ph.D. program exploring Warriorship: Leading Brave-Hearted©. Teara is the first Indigenous woman to launch an airline in Canada. Iskwew Air is connecting people with each other and to the land. Iskwew is a Cree word for woman, and Iskwew Air is for EVERYONE. The name was chosen to celebrate all women, and all those lifting women; an act of reclamation of womanhood, matriarchal leadership, and language. Teara is a proud Métis bridge builder.